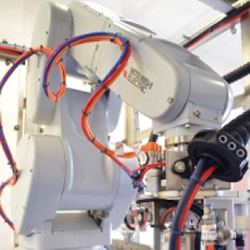 Have you ever wondered if a robot could improve your automated process? In this article, Mitsubishi Electric’s robot product manager Barry Weller, gives five top reasons why you should consider adding a robot to your production line in 2018. The requirement which drives more installations than any other is cost reduction. It may sound counterintuitive to buy a relatively expensive robot to save money, but most benefits of a robot installation boil down to making a process more efficient. Whether pick and place, transferring items or assembling parts - robots are faster and more consistent than a manual process. Faster production with fewer rejects reduces your cost per item, which can have a huge effect on your profitability. It is also likely that a robot cell will have a smaller footprint than and equivalent mechanical system. If space in your factory is at a premium, this could be an advantage. The next reason is often added flexibility. Production lines need to adapt quickly to shift changes or variations in product format. If you can switch over to another task instantly, the benefits are really significant. When you invest in automation, spending money on equipment that can only do one task restricts its future use. The robot, by its nature has fewer restrictions - as long as it is within reach, the robot can handle it. Manipulators and tools that fit on the end of the robot arm can easily be changed, re-purposing the robot in a fairly short space of time. This makes the long-term investment a lot more attractive than cheaper, single function machinery. Anti-robot sentiment suggests they take jobs from people, but that is not always a bad thing. Robots complete tasks that are difficult, tiring or monotonous, allowing people to re-train and do tasks that are more interesting. In short, tasks that require more skills and thought add more value and ultimately pay more to the individual. You don't see lines of people screwing on bottle tops, because repetitive tasks such as packing and inserting are better off done by a robot. Better quality comes from process consistency, finer positional control and superior data management. Robots are fantastically accurate and can repeat tasks thousands of times to within a fraction of a millimetre, and the robot controllers can record operational and performance data to be studied by software systems and operating personnel. This provides traceability information and enables analysis of production processes to allow pro-active improvements to be made. Continuous improvement is a vital part of manufacturing but it requires accurate raw data to deliver maximum benefits. Robots can solve this issue comprehensively. Most of us work in highly competitive markets with increased global pressure as better logistics and infrastructures make it easier to move large volumes of products around the world. Even perishables are now travelling further around the world from the producer to the retailer. If you aren't investing in the latest, flexible automation solutions, you can bet you will have a competitor who is. The positive side to this is that the UK is well served with automation vendors and system integrators who can provide excellent quality solutions and help you invest with confidence. There has never been a better time to consider adding robotic automation to your facility, but we have technical experts who can guide you through the robot 'maze' - trust us, when you're with the right guide it's not as daunting as you might think. Call 01254 685900 for a no-obligation chat and we'll help you find a solution to your requirements.